Wow, what a game and first things first, I have to give credit to all the lads for producing an incredibly gutsy performance that could have produced an almighty shock. In the end, however, Latton maintained their composure and prevailed by just two points as they were forced to dig very deep during the closing stages of this highly entertaining match to secure the win and proceed to the next round of the Gormley Upvc Championship on a score-line Rockcorry 1-13 Latton 2-12. 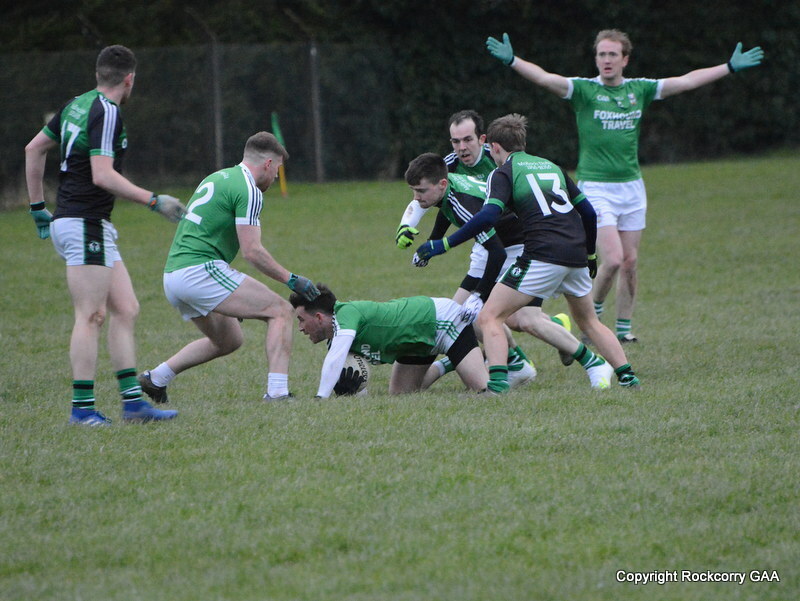 We travelled to Oliver Plunkett’s Park, Emyvale on Friday 6th September to play Latton in the Gormley uPVC senior football championship. This was a thrilling contest and a fine spectacle for our supporters who barely had time to settle after the breathe-taking encounter in the league campaign the previous week and they were treated to another humdinger of a match. The game was played in ideal conditions – without even the hint of a breeze or any rain which fell earlier in the day – on a well-manicured pitch. The game started at a ferocious pace and Latton were first out of the blocks and had a point on the board after two minutes and they quickly doubled their lead when they pointed on the 4th minute. 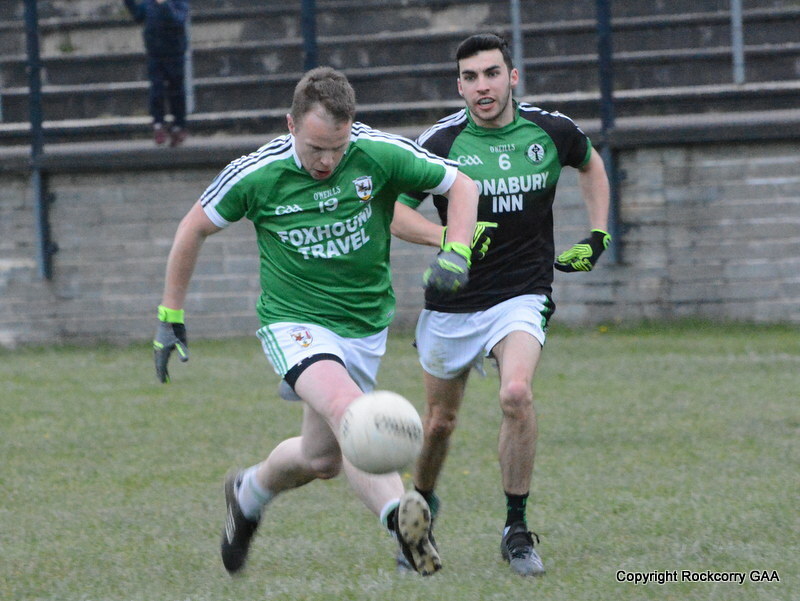 Following on from the league game the previous week Niall McKeown and Noel Carroll showed no signs of any ill-effects and both had outstanding games and when they surged forward on the 5th minute they combined well to tee-up Mark McGuirk who finished in style with an excellent point. After a hesitant start the sides were level a minute later when Mark McGuirk floated over a routine free-kick following a foul on Dwayne Rooney to leave the scoreboard showing 0-2 apiece. After hitting a wide Latton’s superior fire power paid dividends when they converted a free-kick on the 10th minute and the opening goal of the game arrived a minute later to open up a four point cushion 0-2 to 1-3. We instantly replied and Mark Daly scored a majestic point from long range to calm our nerves and shortly afterwards Keelan Clerkin forayed forward with an impressive solo run and he unselfishly laid it off to Anthony Tate who found the target to raise a white flag. Latton stretched their advantage on the 16th minute with a converted free-kick and moments later Damien Matthews broke down a promising attack that initiated a swift move down the field and ended with a point that could have easily been a goal. Noel Carroll, who took possession around midfield area, drove forward with a super solo run and he slipped a delightful pass into Mark McGuirk who quickly flicked the ball through to Dwayne Rooney and a sharp turn left him one on one with the keeper but his low trajectory shot fizzed over rather than under the crossbar to leave the scoreboard showing 0-5 to 1-4. Our defence worked tirelessly throughout the duration of the game as Latton continued to launch wave after wave of attacks and they increased their lead on the 20th minute with a fine point and four minutes later they punished some slack defending and registered their second goal to open up a six point advantage leading 0-5 to 2-5. Our resolve and resilience remained strong and were able to step up and produce a response and the next score had class written all over it (obviously showing no bias!) and it gave our supporters something to cheer about and it even brought Latton supporters to their feet. Centre half back wizard Noel Carroll, whose penetrating runs throughout the match were a joy to watch, (and which sadly Latton had only one answer to –Sean Cavanagh style) surged goal-ward through the heart of the Latton defence and finished effortlessly & cleverly with a superb fist pass over the bar for a top quality score. 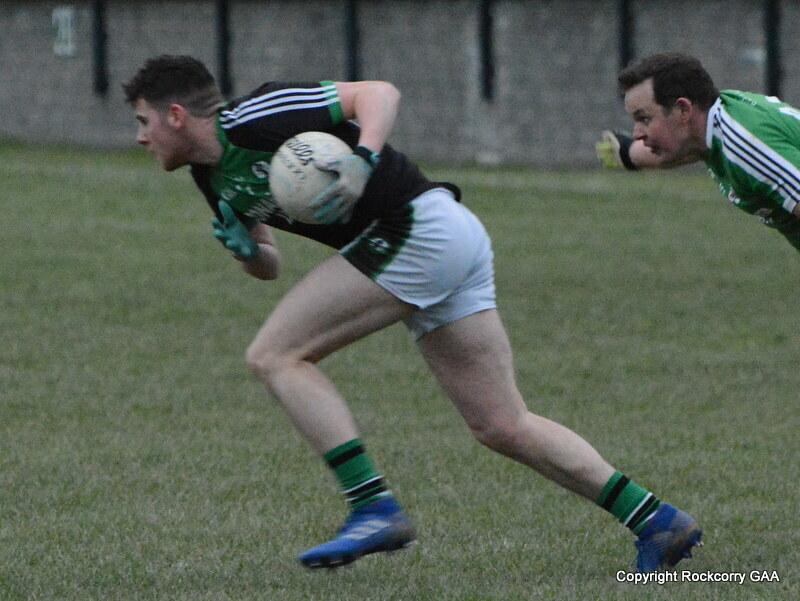 With half time approaching Latton tagged on points on the 30th and 32nd minutes and with additional time nearly up Lorcan Smyth dodged a couple of defenders before applying a cool finish to complete the scoring and leave us trailing by six points at the interval, Rockcorry 0-7 Latton 2-7. We started the second half the brightest and burst out of the blocks with purpose and exactly a minute into the second moiety Paul Mckeown stepped up and provided the inspiration with a magnificent score to round off an eye catching move.Latton kicked wide before notching over a fine point on the 4th minute leaving them seemingly in a comfortable position leading by six points, 0-8 to 2-8. However, it was at this stage that the momentum pendulum gradually swung in our direction and the following ten minutes we were at our most impressive and it was a testament to all the players that they produced their best work. It began on the 8th minute when Lorcan Smyth curled over a peach of a point following a patient build-up involving a number of the players. Fergal McGeough, who was introduced for Anthony Tate, was fouled on the 12th minute, and while Dwayne Rooney’s initial free-kick effort drifted wide the referee noticed an off-the-ball infringement and instructed the free-kick to be retaken and Dwayne made no mistake the second time to narrow the deficit to four points, 0-10 to 2-8. Noel Carroll once again drove forward with a brilliant solo run and combined well with Paul McKeown who set-up Anthony Tate, (who was re-introduced for the injured Garry Calvert who received a horrible eye injury) and when he was deemed to be fouled in the large parallelogram the referee awarded a penalty. Mark Daly confidently stepped up and demonstrated ice cool nerves and calmly dispatched the resultant spot kick to the net, despite a brave effort from the Latton goal-keeper, to remarkably leave the bare minimum separating the sides Rockcorry 1-10 Latton 2-8. Local derbies are always very tough & tense affairs and with only a single point dividing the sides the intensity levels quickly went up from a moderate to turbulent as both teams went hell for leather. We now sensed we could get something from this game and as the match continued to flow end to end Latton, who are a vastly experienced side with a number of current and former county players at their disposal, dug deep and sailed over a point on the 21st minute. 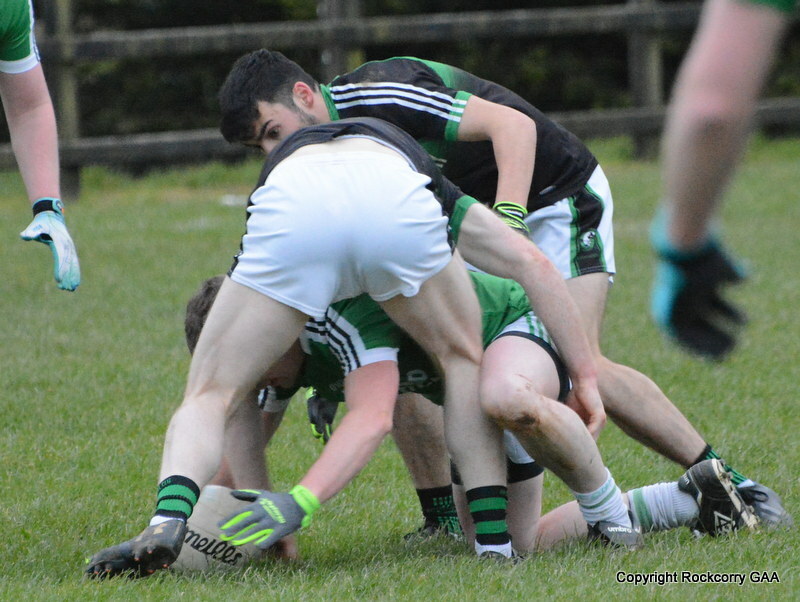 Moments later, Mark Daly converted a tricky free-kick after the lively Lorcan Smyth was fouled but Latton responded quickly to maintain a two point lead, leading 1-11 to 2-10. We hit back with a magnificent point from livewire Mark McGuirk following some neat interplay between Martin Carroll and Paul McKeown but Latton soon added another point to restore their two point cushion, leading 1-12 to 2-11. We refused to give in and with time running out we launched another attack and when Mark McGuirk was hauled down Mark Daly dissected the posts again to put us within a single point with a well-judged free-kick. With normal time almost up a minute of additional time was signalled and had many people questioning the time keeper’s ability due to all the injuries and substitutions that occurred during the second half and we certainly felt that there should have been more injury time! Anyway moving on, possession from the ensuing kick-out was vital and sadly, from our point of view, county midfield star Eoin Lennon raised the highest and fielded the ball which set-off a Latton attack and while we defended manfully in the remaining minutes they were awarded a free-kick which they duly converted to leave the final score Rockcorry 1-13 Latton 2-12. This was an absorbing contest where the lads showed great determination and despite the result it was a battling and courageous display against one of the top teams in the county and we definitely deserved a result from this local showdown. It was a true team effort and there were excellent performances on every line across the field and I have to say the lads have all represented the club with pride and heart and they fully deserve our acclaim for their efforts during this clash. Hard luck lads, it’s a killer to lose a game in that way but you can certainly keep those heads held high because we are very proud of you. 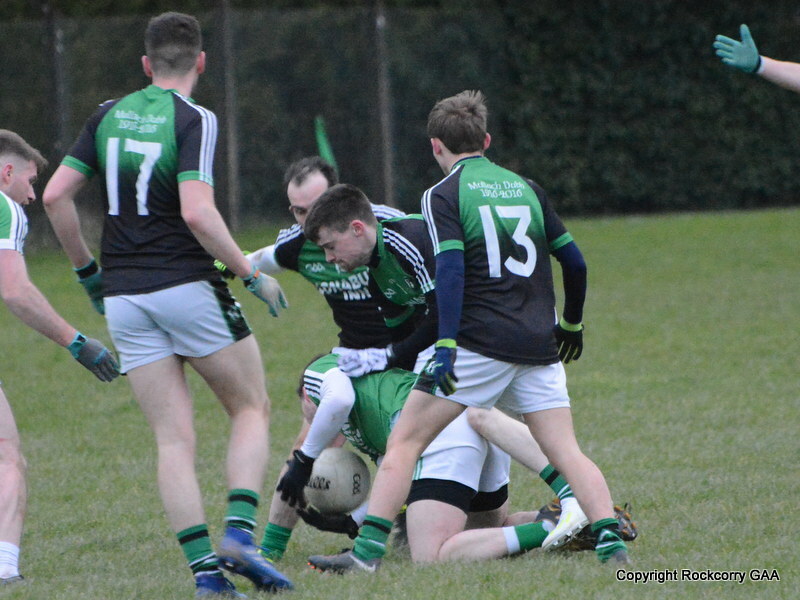 Team & Scorers: Jamie Smith, Damien Matthews, Niall McKeown, Keelan Clerkin, Colin Quinn, Noel Carroll 0-1, Garry Calvert, Mark Daly 1-3, Martin Carroll, Conor McGeough, Lorcan Smyth 0-2, Paul McKeown 0-1, Mark McGuirk 0-3, Anthony Tate 0-1 & Dwayne Rooney 0-2. Subs: Fergal McGeough for Anthony Tate, Keith Daly for Mark McGuirk, Anthony Tate for Garry Calvert (injured), Mark McGuirk for Dwayne Rooney.